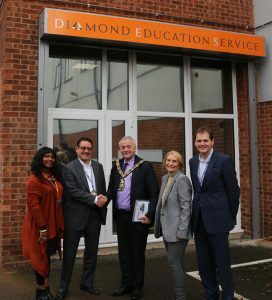 Councillor Ali Gul Ozbek, the Mayor of Haringey, visited Diamond Education Service on 16 December 2016 to hear about the launch of our new company in the borough. The Mayor is appropriately using his year as the mayor to boost the effectiveness of health and education in the borough and so he was very interested to hear about our work with schools, academies and colleges. The Mayor is planning to hold another careers fair for Haringey school children in early 2017 and has invited DES and our sister company, Diamond Build plc, to attend; we look forward to assisting the Mayor in his endeavours as education is close to our hearts too. It was an honour to host the Mayor and we are grateful for the time he took out of his schedule to meet the staff and visit our office in Stamford Road. The Mayor, Councillor Ali Gul Ozbek (centre) meets DES staff (l-r): Lesley Tucker, John Gray, Linda Prince and Robert Hawker. 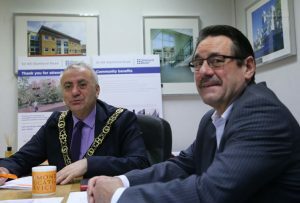 The Mayor of Haringey, Councillor Ali Gul Ozbek, in our boardroom, with DES chairman, John Gray.